If you’ve read anything about Brother’s Food and Wine, you’ll likely know about their prominent location above Bay Station (complete with rumbling subway underneath) or the notable lineage of Chris White and Jon Nicolaou, the chefs and owners at the restaurant. Hence, I’ll leave you to pursue other publications for further details and focus on the restaurant’s cooking instead. By no means is Brothers shabby, the seating is snug, but still comfortable in a minimalist sort of way. Yet, it’s not fancy either. The plates are your average round white cafeteria versions and there isn’t a wasted garnish in sight – everything on the plate is meant to be eaten. In essence, the restaurant does “home-style” cooking really well. In terms of taste, some diners may find the chefs a little heavy handed with the salt and pepper, but it’s perfect for me. 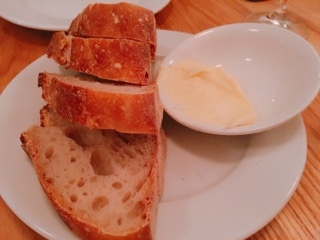 Even the slices of sourdough and butter we nibbled on incorporated bits of salt in the mixture. 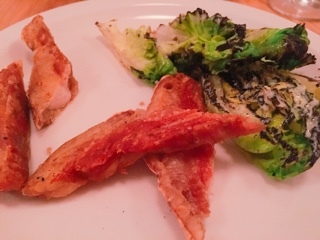 Although it doesn’t look like much, the slices of pork jowl ($17) left me wanting more. As you bite through the crunchy exterior, a pool of melted fat covers the tongue and afterwards you’re left with tender meat and soft chewy cartilage. It’s fatty and indulgent, even the side of baby romaine is charred and slick with a garlicky and slightly spicy Cesare dressing. 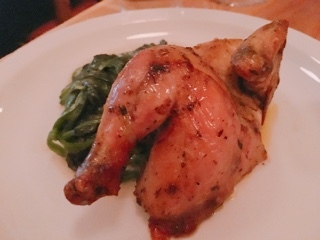 You don’t want to let the Cornish hen ($25) sit too long after the initial cut as it tends to dry out (was on-point for me, but slightly dry for a friend who ate it afterwards). Once again, the kitchen doesn’t hold back with the seasoning: there’s the bite from pepper and a strong taste of thyme or tarragon. Although not exciting, the skin is crispy enough and the creamed spinach a safe but delicious pairing. 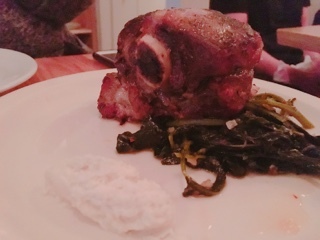 As the heavenly smelling hunk of bone-in lamb ($29) was presented, I start salivating like Pavlov's dog. Although the meat had been cooked for a long period, arriving tender, it’s likely roasted (instead of braised), as the meat stays securely on the bone and the bits of connecting tissues can ever so slightly be sliced away. It’s satisfyingly hearty and if it weren’t the for the restaurant’s public setting, I would have gnawed on the bone (once again like Pavlov’s best friend). 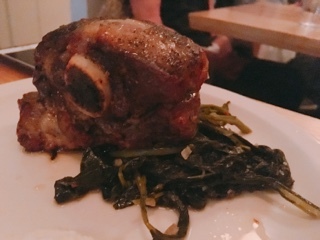 Aside from the salty wilted black kale, there’s a thick dollop of creamed horseradish, which helps cut through the lamb’s heaviness and gives the dish a prime rib feel. 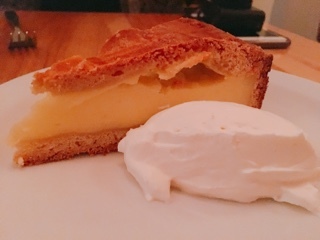 The gâteau Basque ($9) is closer to a pie than cake with its thick buttery shortbread crust. Inside is a fairly thick layer of vanilla custard, which could be sweeter as both the custard and side of whipped cream were fairly neutral. Nonetheless, the solo dessert satisfied and hit the spot. After all, does it seem like most hearty home-cooked meals always end with pie?